Floating Tank Covers | ModuTank Inc. Floating covers fabricated from the same flexible membrane materials as liners are available as options for creating totally enclosed systems. Covers, buoyed up by floatation logs, ride on the fluid’s surface and create practically vapor-tight enclosures. They come with built-in attachments for floatation logs and ballast weights and can be fitted with vent assemblies and flange fittings. Insulated floating covers are available. Rigid, modular, galvanized or stainless steel covers, designed for bolt-together assembly, are available with optional hatches, inlet/outlet fittings and vents. Covers for rectangular tanks can be fabricated in sizes up to twenty feet wide by unlimited lengths. 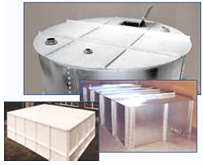 Steel covers for round ModuStor tanks are available.